Pastel is a medium, for the visual arts, which allows both line techniques as in drawing, and area techniques as in painting. There is considerable similarity between the techniques in pastel art and that using charcoal, with the added aspects of color. While there are many types, some custom-made by the artist, they are essentially sticks of pigment compacted with a binder; the binder affects the way they transfer to a surface and can be manipulated. They often look like blackboard chalk, but are usually softer. Pastels are sometimes called crayons, but artist-grade pastels differ from childrens' crayons even though there are professional crayons within the pastel family. Some manufacturers will use a common set of pigments over multiple types of pastel, colored pencil, and sometimes brush-applied pigments, so the mixed media artist can concentrate on the medium type without worry about color variation. Pastels are often used with other media, including charcoal, drawing ink, and graphite pencil. The surface on which pastel is used can have a large effect on the appearance. Paper must have some texture for the fine particles to rub off the stick of pastel. Colored papers are very useful, especially when the finished drawing would include a colored background. There are times where leaving some of the background completely untreated will add a sense of depth, such as a light blue paper for a drawing containing a large amount of sky; clouds drawn with white pastels stand out, as they actually are closer to the viewer than clouds against a sky. There are several main kinds of pastel, although there are variations by manufacturers; some artists make their own. A pastel is usually a round or square stick, with dimensions varying, but typically on the order of 1/4 inch/6mm in diameter; some are considerably thicker. "Full sticks" are 2-3 inch/50-75mm long; some manufacturers also make "half sticks". Pastels are not inexpensive; full soft pastel sticks, from a major manufacturer, may cost between USD $2-4 each. Even though many of the variations are in intensity, so the artist can blend the variations, an attraction of the half stick is to have many shades that are reproducible. Handmade pastels can be $6 or more; there are also cheaper student grades that may be less intense, or not use some of the more subtle and expensive pigments. The softer forms often have an easily-peeled paper jacket to add strength. Pastel pencils are also made, in which a pastel is jacketed in conventional wood, which both allows fine line work and is less delicate in the hands of a beginner. Some pastel pencils are made with a water-soluble coloring material, which can be spread with a wet brush. They are mixtures of a pigment, a material that binds and usually lightens the intensity (e.g., chalk dust), an adhesive (e.g., gum tragacanth), and preservatives. The first two types are mixed using a water base. The next two use various waxes. Each creates different visual effects and may use different techniques (e.g., dry rubbing vs. wet brushing). Some vendors, such as Prismacolor, provide the identical pigments in different textures, although a Prismacolor soft pastel is harder than most soft pastels. When the artist has experience with several brands, one may mix freely, but it is wise to limit the number of manufacturers and styles when first learning. Soft pastel: crumbles easily with light pressure; often deliberately applied as a dust and spread with fingers, tightly rolled paper stumps or tourtillons, brushes or knives. With a gentle touch, they can be used to draw lines, often that will be spread out. Hard pastel, again pigment and binder, held together by pressure. Some manufacturers, such as Prismacolor, also varnish the outside of the stick. While they still can be spread and blended, they lend themselves more to distinct line drawing, with the width varying with the angle at which the pastel is held to the surface. They are a good starting type until the artist learns the effect of hand pressure; an artist experienced in a painting technique can probably go directly to soft pastels, then use hard pastels for specific purposes. Oil pastels are fairly soft, soft enough to be blended or erased, but more adhesive than a soft chalk pastel. It is possible to build up layers of oil pastels, where chalk pastels would simply crumble from the surface without special techiques. They have some of the characteristics of oil painting, but different effects are possible. Their primary binder is a soft wax, and the appearance can be modified with oil painting solvents such as linseed oil and turpentine. Some artists believe they are inferior to oil painting, some believe they give distinctly different effects. Parents and teachers often observe that they can teach the rudiments of oil painting with far less mess. Crayons, of both the childrens' and professional types, also use a wax binder, but one much more transparent than in an oil pastel. The childrens' pigments are often less stable to light than those used in professional wax crayons, but they can be stabilized if covered with an appropriate fixative. Pastels, especially soft ones, routinely break. This is not a bad thing, as small pieces have sharp edges for detail, or can be used horizontally to cover larger areas. It is, however, wise to store the pastels in foam-lined cabinets. Some artists fill plastic containers with rice and use them to store and clean small pieces. When blending pastel sticks, they often pick up undesirable traces of other colors. One way to clean them is to put them in a container with a lid, cover them with coarse cornmeal, close the container and shake gently for a few minutes. These are basic descriptions; there are nuances to the use of all the types. Some manufacturers will be mentioned to show variations. A Schmincke soft pastel is softer than a Royal Talen Rembrandt soft pastel, but many pastelists will use different brands within the same class. One manufacturer may have a pigment that another does not or makes a metallic pastel with a fine metal dust mixed with the binder and pigment; they simply have a different "feel" in the hand. While a basic rule is that soft pastels cannot be layered while oil pastels can, but soft pastels can be spread more lightly, using the hand, than oil pastels, "the specific features of both media can all be inverted by the artist! Degas made an intensive use of fixative and this allowed him to work over earlier layers [of soft pastel] without disturbing them." Soft pastels usually are round. Some handmade types, such as Unison by John Hersey, or Diane Hersey's Terrages and Soft Form, are irregular shapes with a paper jacket. These handmade pastels have little or no filler; they are nearly pure pigment with a minimum adhesive. The Terrages line contains abrasive pumice to force the pigment into the deep recesses of the paper. The softest, such as PanPastel, are not in sticks at all, but come as powders to be applied with brushes or other applicators. Hard and soft pastels can be used together in a controlled manner. The basic rule is to use the hard pastel to add detail on top of the soft pastel, putting in finer details with the hard. Pastel pencils also can be used to add detail, although other media, such as pen & ink or permanent marker, also can be used for this purpose. While they can be sprayed with fixative, oil pastels do not harden as much as the other types. Still, they are usually the most intense other than perhaps some very expensive soft pastels, and lend themselves to layering and mixed-media methods. Professional crayons are much more intensely pigmented than childrens' crayons. Their hardness varies; some such as Caran D'Arche, put their hardness as "softer than colored pencil", which tend to be as hard or harder than many pastels. 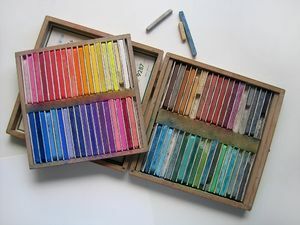 Even though their binder may be wax, many brands are water-soluble and will work with wet brush techniques, while most soft pastels will not. It is possible to use childrens' crayons in a multimedium work, if their unique characteristics are understood and exploited. As opposed to chalk- or clay-based pastel, or pastels that are pure solid pigment, these crayons are translucent. They can be used as an overcoat to adjust the color of pastel underneath, although they are soft enough that fixative is still required. They can also be used for lightly colored areas, letting the paper surface show through them, as part of an overall drawing. Related delicate effects can come from watercolor or brushed, diluted ink. Some pastel bases are to some extent water-soluble, so wet brush techniques can complement dry blending. Some very soft pastels and powders can be applied with a wet brush, but are more opaque than watercolor. The most basic blending tool is the artist's finger. Some prefer to use either short disposable rubber or plastic fingertip cots, or full-hand gloves, while others find they prefer to have the sensitivity and texture of skin. Pastels are easily washed from skin. Next most common are stumps of tightly rolled paper, or softer tortillons of paper wound tightly, but with a hollow center. A textured cloth, such as a chamois, is useful for blending over large areas, and also for removing excess pigment. There are various specialized brushes, foam-tipped tools, and spatula-like metal tools. An ordinary cotton swab can be useful. A number of sponges and applicators used for facial cosmetics have textures popular with some pastel artists. Pastel papers need to be reasonably firm, which will typically be rated as 60 to 90 pound paper stock. By comparison, ordinary copier paper is 20 pound. Watercolor paper is 140 pound or more, and may be needed if wet brush techniques are used extensively. The paper must have some texture for the pastel dust to transfer and spread. There are a wide variety of suitable papers, with textures ranging from a slightly textured paper, to a velvet-like pile, to papers made or covered with an abrasive. For minimum cost, although not permanency, newsprint will work, followed by medium-surface copy paper. Many pastelists find that tinted paper is yet another technique. While one can stock commonly used tints, it is possible to custom-color paper by covering it with a clear base called gesso. Gesso can be colored with acrylic artist colors to give a transparent finish, while white flake pigments can be mixed into it to give opacity. When preparing paper with gesso, it should be stretched with a frame or tape, lest it wrinkle or distort. Pastels, by definition, are soft and smear easily. Once a drawing is finished, it needs to be covered with a clear fixative. There are fixatives that can give particular surface textures and may be brushed on. Most common is to use a spray of a commercial fixative, which also protects against ultraviolet light and fading. For pastel drawings that are not expected to be kept for long periods, an ordinary hair spray can be an inexpensive fixative. Some, however, will discolor over time. Some artists simply begin the drawing in pastel. Others may start sketching with artists' charcoal, which blends well with pastels. Graphite pencils and sticks, which have a smooth texture, may not be a good base for pastels. If they are desired, there are textured fixatives that can be brushed or sprayed onto the paper, to give a better pastel surface. These fixatives, however, will not give the range of surfaces available from pastel papers. While sometimes cumbersome if working from a sketch, one method, if starting from a photograph (a very good idea if trying to draw cats), is to tape tracing paper over the photographic print, and then use a pencil to trace the main elements of the image. Next, put an artists' "carbon paper (actually a wax-free graphite paper)" over the sheet on which the paste is to be used. There are white and gray "carbons" that can put an image on dark-colored paper. Tape the tracing over the carbon paper, and then, using a pencil, redraw the lines of the tracing. Since the tracing will be discarded, it is often wise to use a colored pencil to see what has been redrawn. Remove the carbon paper and tracing paper, and the basic outline, in a material that will not repel the pastel, is now on the drawing paper. Depending on one's freehand sketching ability, it also can work perfectly well to have a photograph, as reference, next to the pastel paper. This page was last modified 15:13, 18 May 2010.